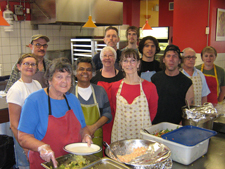 St. John's Kitchen operates largely through the work of volunteers. People accessing supports and resources at St. John’s Kitchen contribute to the preparation and serving of the meal alongside other community members. Working together, we serve a hot meal each day for around 300 people. 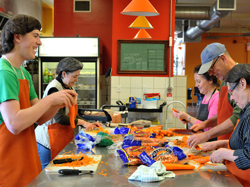 Volunteering at St. John's Kitchen is fun, convivial, and different every day. The spirit of sharing – work, food, conversation, friendship – makes St. John's Kitchen thrive. There is an open invitation for anyone to come and volunteer. 9:00am-11:00am: preparing the meal for the day. 11:30am-1:00pm: serving the meal, bussing tables, and washing dishes. We need people for all of these shifts, and value people to stay as long as they can. If you have not volunteered at St John's Kitchen before please contact us so we can give you an orientation.